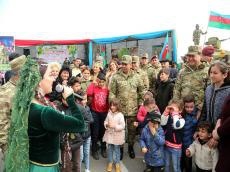 On the eve of the Novruz holiday, on March 17, the Open Doors Day was held in military units with the participation of parents and relatives of soldiers, as well as representatives of the public and cultural workers, the Azerbaijani Defense Ministry said March 17, Trend reports. The leadership of the Ministry of Defense led by the Minister of Defense, Colonel General Zakir Hasanov took part in a festive event held within the scope of the Open Doors Day in one of the military units. During the event, the citizens who visited the military unit got acquainted with the conditions created here, and also visited the office and administrative buildings, soldiers' barracks, and mess halls. During the meeting with the leadership of the ministry, the issues of interest to parents were discussed and all questions were responded. After discussions with the parents of the soldiers, the minister gave relevant instructions in connection with the solution of a number of issues. After the festive concert organized for the military personnel, the Minister of Defense, servicemen, and visitors dined together at the festive banquet.